NorthStar Lodgings - Cascades Townhome C606 - Moose Hollow, Eden, Utah. 4 bedroom.4.5 bath, sleeps up to 20, dines up to 27, private hot tub, theatre room, game room, lots of extras. This amazing 4 bedroom townhome in the Cascades at Moose Hollow is perfect for larger groups and for those smaller parties who want several separate beds since there are a total of 13 different bed surfaces! It is mountain rustic charm at its finest. Throughout this townhome you will discover genuine antiques such as a metal safe from an old movie theatre, a treadle sewing machine like your great grandmother may have owned, and unusual tools and implements all from days gone by. You’ll find these things right along side rich fabrics and leathers, custom furnishings, and the latest in modern convenience and technology. The views overlook the community, and surrounding mountains to the west plus this townhom sits right alongside Fairway #2 at Wolf Creek Golf Course and takes in the scenery from the family room and patio to the south and east as well. This property is only minutes from Pineview Lake, Powder Mountain, Snowbasin and Nordic Valley Ski Resort. There are three living levels that offer many options to gather together as well as separate areas when you just need a little space of your own! Perfect for multiple singles, couples or families, this property includes a very large gathering area where the kitchen, dining and family rooms flow together to seat up to 27 for dining just in case you have additional family and friends coming over. The 4 bedrooms were each designed to accommodate a family or party of some size. Comprising these bedrooms are 4 King beds, 2 Queen, 2 Full, and 4 Twins. Additionally there is a sofa sleeper in the living room. All four bedrooms have either a fully tiled luxury private or adjacent bath plus there is a powder room on the main floor. Entertainment, fun and gathering together is the theme of this home. If you don’t have a great time here, it’s not our fault ~ we couldn't think of anything else to add! As you enter this townhome on the main level, you’ll delight at the warmth and comfort if offers with its two-story rock gas fireplace and inviting furnishings including an old wooden Indian statue affectionately named Nephi by a two-year old grandchild and a massive 8 X 6 foot mirror mounted high above on the 2nd story wall ~ accomplishing that was a real feat! There is a TV with satellite, DVD and VCR above the fireplace for your entertainment. From the living room you will walk into the kitchen, dining and family room which are the heart of our home. We love to gather with family and friends for meals, laughter and conversation and believe you do too! The large U-shaped kitchen has more than enough cabinet space and plenty of room for several cooks. We offer just about every kitchen appliance and gadget to make meal preparation simple plus a double oven, roaster oven, two sinks, a large island and lots of counter space. We have three gathering height tables that can each seat up to eight persons plus counter dining for three. Up to 27 can dine, laugh, party and enjoy being together, or for a smaller group, the individual tables are perfect! The adjoining family room focuses on the warmth of the fireplace and rustic mantle made from an old sycamore tree and an old antique safe owned by my parents. Above the fireplace is a 37” flat panel LCD TV with DVD, VCR and satellite. It is mounted on a cantilever arm so it can be adjusted for everyone in the kitchen, dining, and family room to view at the same time. This level also has a powder room and the two car garage leads right into the kitchen for ease of transporting groceries! Finally, just off the family room is our patio that looks over the golf course and mountains beyond plus has a gas BBQ grill and a private Caldera Hot Tub for 7. The upper level features two private bedrooms. The first is the Master King Suite. The bed is a wood and leather sleigh bed and the TV armoire hosts a large TV with satellite and DVD capability. This bedroom has two large walk-in closets that can each double as a “baby-suite” and the private bath is fully tiled and very luxurious. There are two separate vanities plus a Jacuzzi type bath tub, large glass-enclosed, double headed shower and private toilet room. The second bedroom also has a king bed plus a twin over twin bunk to accommodate a family of four. There is an adjacent full bath combined with the washer and dryer next to this 2nd bedroom. The lower level is truly awesome! It features the 3rd bedroom which has a custom made king over king bunk bed specifically designed for that room. There is also a stone gas fireplace with TV, satellite and DVD for your enjoyment. This room also has a large shower bath with walk-in closet. A family of 4 definitely feels like they have their own little getaway here! The final bedroom we call the Woodlands because of the three custom made bunk beds it has here – kind of feels like a forest! There is a queen over queen bunk, a full over full bunk and a twin over twin bunk. Sounds like a slumber party (or not!). The final two rooms in the lower level are strictly for your fun and entertainment! The home theater room is complete with raised viewing platform for the back row seating while enjoying your choice of satellite or DVD entertainment on 65" flat screen TV, 7 channel surround sound system. Lots of really great fun here – be sure to bring along your favorite movies or concerts! Adjacent to the theater room is the game room featuring a full-size pool table, air hockey, foosball, chess table, and game cabinet with many games and activities to choose from. There is a wet bar with mini-fridge and microwave in this room as well. Did we mention the radiant floor heat on this level to warm your feet in wintertime? We hope our townhome will be just perfect for your gathering and we look forward to having you stay here! Bedroom 4: 2 Queen Beds (Queen over Queen Bunk); 2 Full Beds (Full over Full Bunk); 2 Twin Beds (Twin over Twin Bunk) (downstairs). Private ensuite bath, standard tub/shower combination. 2nd entrance to bath through game room. 5 TV's - All with satellite and DVD, some with VCR capability. AREA SPOTLIGHT: The Moose Hollow community is located in Eden, Utah and near Powder Mountain, Snowbasin, Nordic Valley and Pineview Reservoir. Did you know it is the perfect location for your next family reunion or gathering of a large group ~ winter, spring, summer or fall! No matter what season of the year, there is plenty to see and do in this beautiful upper Ogden Valley! Moose Hollow and the Cascades in Eden, Utah are a wonderful place to stay for vacations and gatherings of all kinds year-round! The homeowners association office is in the heart of the community and behind the HOA office is our seasonal pool complex with regular size swimming pool, kiddie pool, in-ground hot tub, dry sauna, plus lounging and deck furniture, and a grassy picnic area with charcoal grill. Additional picnic areas and grills are offered adjacent to the pool area and other locations throughout the community. The in-ground hot tub and dry sauna are open year-round and so is our 2nd community hot tub which is nestled between other condo buildings. Also offered at our community is a 3000 sq. ft. Clubhouse that can be reserved for private functions, and has a small fitness center in the lower level. On site there is also a sand volleyball area, basketball hoop and enjoyable walking trails that meander throughout our community past streams, ponds, waterfalls and fairways. During ski season, there is fee based shuttle service to Powder Mountain offered by the Utah Transit Authority (UTA) which comes right through Moose Hollow several times a day. Find out more details by visiting Powder Mountain's website and "The Mountain" tab. Look for the UTA ski bus service. Cancellation Policy: The deposit is refundable (less a $30.00 cancellation fee) if cancelled 60 or more days before arrival or if we are able to fill the reservation within the 60 days. 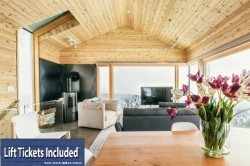 We are truly excited and honored to share our homes with each and every guest and we invite you to stay with us at Powder Mountain Getaways ~ C606!